Welcome to the 12 Weeks of Christmas Blog Hop 7! 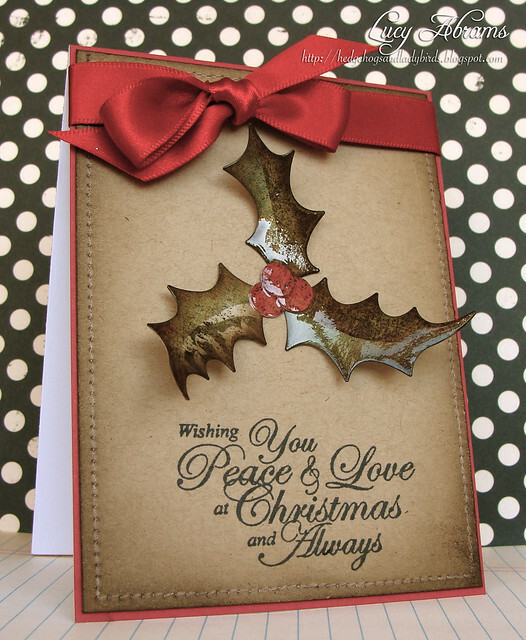 Every Wednesday up until Thanksgiving different designers will be joining some of the JustRite design team for a series of Christmas blog hops, showcasing JustRite’s entire Christmas Collection of stamps! You also might see some projects from the JustRite design team, using some of their newly released line of cling stamps! You can find JustRite's new collection of cling stamps HERE. This week, Spellbinders and Caardvarks design teams are joining in the fun, and I had to play along. I used the Christmas Nested Sentiments and Verses set on this card, combined with some old Basic Grey stickers, which I covered in Glossy Accents, and some lovely satin ribbon from The Ribbon Girl. Hope you want to join in the fun. Scroll down to see the blog hop list, or click HERE to go to the next blog on the hop. Love this Lucy! What a great way to makeover old stickers! Beautiful card!!! I really like the affect of the gloss on the mistletoe! Very nice Holly leaves! Gorgeous card! That is beautiful. Love the sticker covered in Glossy Accents! Grreat tip! So pretty Lucy!! I love your style!! Wat een inspiratie, geweldig mooi. oh, love your card, Lucy! so, so beautiful!!!! Oooooh I love the glossy accents that you added to the sticker. It made such a gorgeous card and this is my favorite sentiment stamp!!! Beautiful card!! I love the holly and the kraft paper with the red! Lucy, I subscribe to your blog feed and I rarely leave a comment (me bad blogger), just wanted to say I love your simple, classy style, every single card on here leaves me wanting all the products you have used on it, just fab designs!!! Wow! This is just lovely, Lucy!